NOTES: The soul is equated to the poetic imagination in this poem. Ascribing the poem to the latter, the first stanza deals with how imagination gives life to the body. It transforms a mere body to a spirit. Percy Shelley in his A Defence of Poetry later echoes the idea that the spirit is superior to the body. What the imagination consumes it makes a part of itself, "as fire converts to fire the things it burns," and as the food we eat become part of us. 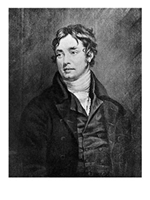 The second stanza discusses how the imagination takes material from the earthly realm and idealizes them so that they can transform into "proper nature," which goes back to Coleridge's idea of " the truth of nature" and the purpose of poetry. Finally, the third stanza is also a return to another of the cardinal points of poetry, which is to let imagination offer us new and interesting ways of looking at something we are already familiar with. Sensual pleasures are transformed into cerebral ones.